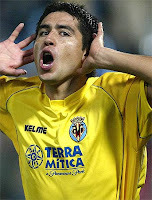 An article in Ole (Spanish link) indicates that despite reports on Friday that Boca could still negotiate a deal for Juan Riquelme with Villarreal, it seems that any hope of this happening is now all but gone. Mauricio Macri is quoted as saying that there is "only a 10% chance of a deal occuring", with Villarreal unwilling to sell the player for what Boca were offering. Boca's offer of 5million Euros + 20% of the transfer proceeds when either Rodrigo Palacio or Ever Banega are sold was rejected out of hand by the Spanish side. It seems that Riquelme will now have to rot in the Villarreal reserves until January, unless the board and manager Manuel Pellagrini decide to reintroduce him into the side, although this seems unlikely, even after their 5 - 0 defeat to Real Madrid at the weekend. Pellegrini already has a plethora of attacking-midfielders such as Matias Fernandez, Robert Pires, Santi Carzorla and Ruben Cani, so it is hard to see how Riquelme would fit into his plans, even if common ground could be reached.